The labour force of Newfoundland and Labrador is now more highly diversified than is usually realized. There are more people working in manufacturing (excluding fish processing and the pulp-and-paper industry) than in fish harvesting, and more in food and beverage services than in fish processing. This diversification has been the product of a century and a half of effort through a range of development strategies and policies, and although none proved as successful as their proponents hoped, they all contributed to long-term industrialization and diversification of the provincial economy. It is useful to distinguish six main approaches. For the first three centuries after the arrival of Europeans, the interior of Newfoundland and Labrador remained unexplored. Road building began in earnest in the 1830s, and in 1838 the first geological survey was started (Prowse, 1895: 454). Later in the century, as the fishing and sealing industries went through difficult times, government and business began to plan for the exploitation of land-based resources. They believed that the construction of a railway across the island would be the best way to gain access to timber and minerals. Lacking sufficient capital of its own, the government turned to outside investment and outside promoters to provide the capital and entrepreneurial drive. This was to become a recurrent pattern. 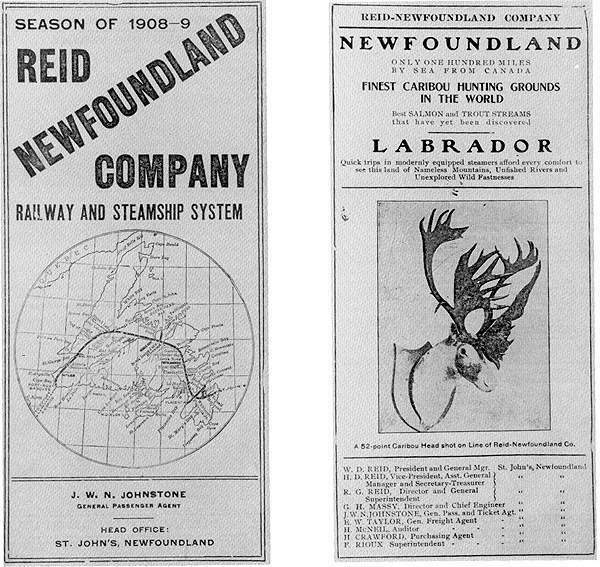 The government entered into a long-term contract with the Reid Newfoundland Company for the operation of the railway, which was completed in 1898, on terms highly favourable to the company (Perlin, 1967: 438). Reproduced by permission of Mont Lingard. From the Collection of Mike Shufelt, Next Stop: Gaff Topsail (Grand Falls-Windsor, Newfoundland: Mont Lingard Publishing,	Mont Lingard and Mike Shufelt, ©1996) 63. While the indebtedness it incurred was to plague the government for years and contribute to its demise, the initiative nevertheless did contribute to economic diversification. Mines operated and gave rise to the establishment of resource towns such as Bell Island, St. Lawrence, Buchans and Baie Verte. These mines have since closed, causing considerable social disruption in the communities affected, but for long periods they provided prosperity and employment to hundreds of Newfoundland families and a welcome new sector to the island's economy. Pulp and paper mills were established at Grand Falls and Corner Brook. The Grand Falls mill closed in 2009, but operations continue in Corner Brook, even though employment in the mill and the woods operations has been much reduced by mechanization. While opening up the interior has been plagued by many problems - government indebtedness, outside ownership and control, and the social problems of resource towns that have lost their resource base - the strategy nevertheless proved successful in diversifying a single-resource to a three-resource economy. The comparative disadvantages of a small local market, distance from major metropolitan markets, and high transportation costs have limited the development of manufacturing in Newfoundland and Labrador. The manufacturing industry has contributed to economic diversification in the past and promises to do so even more in the future. There are three phases in the history of manufacturing. The first, in which mainly local companies produced for the home market, grew to prominence in the early years of the 20th century. It was protected from outside competition by the small purchasing power of the local economy and by a customs barrier imposed by the Newfoundland government. Many small firms succeeded through manufacturing such things as rope, barrels, paint and beer for the local market. The advent of Confederation in 1949 undermined this local manufacturing sector. The elimination of the customs barrier opened up the market to larger, more efficient competitors from mainland Canada, and the infusion of cash from federal coffers provided new purchasing power to make the new provincial marketplace attractive to outside firms. Many local manufacturers closed their operations or sold out to mainland competitors (all the local breweries, for example), and found a new niche as local "agents" for mainland producers. The few firms that survived (notably Standard Manufacturing, which produced Matchless paint) did so by becoming more competitive and selling products into the mainland market. The second phase was part of the new provincial government's efforts at economic development after Confederation. As part of his "develop or perish" policy, Premier Joseph Smallwood used up much of the fiscal surplus he had inherited from Commission of Government in a rash attempt to lure outside entrepreneurs to set up manufacturing enterprises in the province. The province was intended to become a diversified manufacturing centre producing such things as rubber boots, leather shoes and chocolate bars. Unfortunately, most of these enterprises were ill-conceived and contrary to the basic principles of economics. The products could not compete in the local marketplace, let alone in outside markets. Most of the ventures failed, money was squandered, and businesses became wary of manufacturing ventures for many years. Some of the ventures, however, survived under new ownership and management, and some flourished, notably Terra Nova Shoes in Harbour Grace, which sold high quality work and fashion boots to mainland and overseas markets for over 40 years. The third and more promising phase of small-scale manufacturing in the province was composed mainly of new firms or re-structured older firms that used new production, communications and transportation technologies to compete in the global marketplace. Firms could be competitive in batch production for selective market niches in sectors such as electronics, computer software, specialized clothing and high-value food products, rather than in assembly-line production for mass markets. In the first post-Confederation government, conventional economic wisdom vied with political expediency in the formation of policy, resulting in an inconsistent approach to development. On the one hand, through various subsidization schemes and by convincing Ottawa to introduce unemployment insurance for self-employed fishermen, Smallwood maintained his popularity in rural Newfoundland, and these policies encouraged people to stay in the outports. On the other hand, he and his advisers were imbued with the dominant economic thinking of the time, which was that industrialization and urbanization were the route to modernization and prosperity. Following the early failure of his small-scale manufacturing efforts, Smallwood turned to large-scale industrialization as the path to economic development. The accompanying social policy was community centralization, a resettlement programme through which thousands of people were encouraged to move from hundreds of coastal communities to larger centres. These were meant to be growth centres, in which a concentration of population would stimulate new economic activity. In most cases, however, it simply meant fewer and larger outports still dependent on the same scarce resource base. Nevertheless, the community centralization program did mean that more people could enjoy modern services and infrastructure at a cost the government could afford. Smallwood's main economic legacy was large-scale manufacturing and resource-based industrial projects. The resource-based projects were in Labrador, which was portrayed as a great storehouse of resources to be exploited for the benefit of Newfoundlanders (a matter of much concern to Aboriginal and other Labradorians). The main projects were the massive hydroelectric project at Churchill Falls and two large iron ore mines in western Labrador, which gave rise to two new towns near the Québec border, Wabush and Labrador City. These projects created thousands of person-hours of employment in their construction phases, and many families from the island moved to western Labrador to take advantage of the new opportunities. Many found permanent employment in the operations phases of the projects and became residents of Labrador. This economic activity, combined with generous federal government funding for the building of modern infrastructure - roads, schools, hospitals, electrification, water and sewer systems - gave rise to boom conditions and apparent prosperity during the 1960s. Rapid modernization also gave rise to an unintended diversification of the economy: The service sector grew rapidly and became the main generator of new employment. Beneath the surface, however, all was not well. As the construction boom ended, thousands were left jobless and dependent on unemployment insurance. Construction, rather than the fisheries, became the occupation of last resort in Newfoundland. In time, it also became clear that outside interests, rather than local citizens, were reaping many of the benefits of the new mega-projects. Lacking the public sector funds and suspicious of the local business class that had opposed his campaign for Confederation, Smallwood turned exclusively to outside promoters and investors to bank-roll and manage the new mega-projects. Most of the spin-off benefits and profit-making accrued elsewhere, and the infamous Churchill Falls hydro contract, through which the Province of Québec reaps most of the financial benefits from the project, became an embarrassment to the Smallwood government. Large scale manufacturing projects included a phosphorous reduction plant at Long Harbour, a linerboard mill at Stephenville, and an oil refinery at Come by Chance, all of which encountered serious problems and consumed a great deal of public money. In spite of difficulties, these mega-projects contributed to the long-term diversification of the provincial economy. Come by Chance initially failed, but was bought by new owners and continues to operate; the Labrador linerboard mill failed, but was taken over and re-furbished by Abitibi in 1981 to become the province's third paper mill; the iron ore mines and the hydroelectric project in western Labrador continue to employ people and contribute to the gross domestic product of the province. The passionate conviction that resource-based industries could and should be contributing more to the economy, and should become the foundation for further diversification became the rallying call of the Progressive Conservative governments under Frank Moores and Brian Peckford for the 17-year period 1972 to 1989. If Newfoundland could gain control of its rich natural resources and manage them in the best interests of the people of the province, then jobs and prosperity could be ensured. Despite their best efforts (as, for example, in taking public ownership of the Churchill Falls Development Corporation), Moores and Peckford found this new approach very difficult to implement. The government was too constrained by dependency on outside capital, contractual obligations and the jurisdictional limitations of a small provincial administration. They did achieve some success, however, in a new resource industry, oil and gas, which was not so constrained by past practices. Their main achievement was the Atlantic Accord, signed in 1985 (House, 1985: 303-312), which ensures that many of the employment and spin-off benefits from offshore oil and gas development will accrue to the province. With the giant Hibernia field already in production and other fields pending, a significant new sector has been added to the provincial economy. Not only the oil and gas industry itself, but the spin-off benefits to engineering, electronics, information technology and other local firms, bode well for the further diversification of the provincial economy. Most of the new activity will be centred in the St. John's region and a few other centres, such as Marystown with its ship-building and rig-servicing capability. Fisheries-dependent rural communities will be mainly unaffected. The most pressing problem for the future is what to do about rural Newfoundland and Labrador. What will happen to the outports? While the main determinant will be the future of the fisheries, another important factor will be the success or failure of efforts to develop alternative economic activities in rural regions. Even the most optimistic forecast for the future of the fisheries is that the sector will employ far fewer people than in the past. What else will there be for people to do? There have been several efforts at diversifying the rural economy. The Commission of Government in the 1930s instituted a settlement program under which previously unemployed people could earn a living from the land. This scheme was marginally successful; only 171 families lived in the land settlements by 1938, while Newfoundland's relief population was nearly 90,000 (Neary, 1988: 65). More promising, and more successful, was the emergence of a grass-roots rural development movement during the 1960s, largely in reaction against the government-imposed resettlement program. With the change of government in 1972, this movement was given state encouragement and financial support. Regional development associations were formed in most regions of the province and, while they focussed mainly on fisheries-related projects, they also gave rise to many small-scale industries such as crafts, tourism, aquaculture, agriculture and secondary food processing. The rural development movement became largely deflected from its original purpose during the 1970s and 1980s through the emergence of government job creation or "make-work" projects. Most of these projects were short-term geared more towards qualifying people for unemployment insurance than to the long-term diversification of the local economy. Development associations unwittingly became co-opted by government as the local agents of these make-work schemes (Government of Newfoundland and Labrador, 1986: 365-371). In response to this, the 1986 Royal Commission on Employment and Unemployment advocated a new approach to rural development. The provincial government under Premier Clyde Wells, in cooperation with the federal government, attempted to pursue such an approach during the 1990s; and this has been continued under Premier Brian Tobin. The "new" regional economic development was organized on the basis of 20 regional economic development boards in 20 economic development zones covering the whole province (Government of Canada/Government of Newfoundland and Labrador, 1995). The purpose was to pursue a more professional and business-like approach to rural economic development aimed at establishing viable enterprises that would operate independently of government support in the long term. Boards were established and most submitted five-year development plans for their zones. Recent technological changes, particularly in telecommunications, have changed the terms of international trade, making it more feasible for Newfoundland and Labrador-based firms to be competitive, and opened up many new economic opportunities in sectors other than resource sectors. The Economic Recovery Commission (1989 - 1996) identified several sectors in which there are new opportunities, and worked with private sector partners and educational institutions to develop strategies for growth. The sectors include innovative technologies, information industries, manufacturing, health services and products, aquaculture, adventure tourism and secondary food processing. The emphasis is on making the sectors competitive in both the domestic and export markets (Economic Recovery Commission, 1992). Although operating from a small initial base, some of these sectors have shown remarkable growth rates and augur well for the further diversification of the provincial economy.